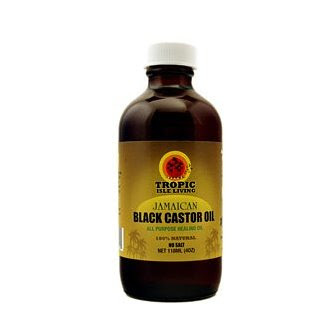 A lot of you have questions about Jamaican Black Castor Oil, and how you can use it for your scalp, edges, and ends. Shelli from Hairscapades gives us the scoop on her experience with JBCO and perfectly describes how and why she came to love it. Read on, and post your questions in the comments!! 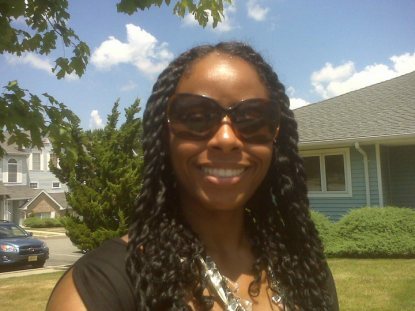 When I first discovered CurlyNikki.com, I learned of the principles of moisturizing and sealing. Unbeknownst to me, I had essentially been doing that with my WnGs, using a leave-in (Infusium 23 or DevaCare One Conditioner) and applying a mix of alcohol-free gel and Carol’s Daughter Healthy Hair Butter. However, with newly discovered information about other options in hand, I decided to branch out and experiment. First, I tried shea butter, which Nikki seemed to love. As our hair types appeared similar, I thought it might work well for me. That wasn’t the case. I found that shea butter just seemed to “sit” on top of my hair and made it feel weighed down without feeling particularly soft or moisturized. Next, I decided to try virgin coconut oil (VCO) as it was lighter and I’d read a few good things about it. Well, it was definitely a lot lighter and my ends looked and felt great after applying it to my released TnC. But, by the end of the same day, my ends felt “crispy.” I thought this might have been related to an apple cider vinegar (ACV) rinse that I’d tried for the first time as well. But, after a couple more uses of VCO without an ACV rinse, I decided that it definitely did not seem to keep my hair feeling soft and moisturized. Therefore, I was still in search of a good sealant and eventually came across this post on CurlyNikki entitled, Battle of Castor Oils. The short of it was that the writer was comparing castor oils for use on her scalp as she’d suffered with eczema for years. She rated JBCO as the best. As indicated above, I didn’t use it on my scalp for long, so didn’t notice any type of difference in texture. In regard to shedding, I did experience a lot of shedding during the time I was using JBCO, but I really believe that was due to amla. So, I can’t give you any insights on that. However, there was this article by blogger Strawberricurls, who helped her mother regrow her edges! 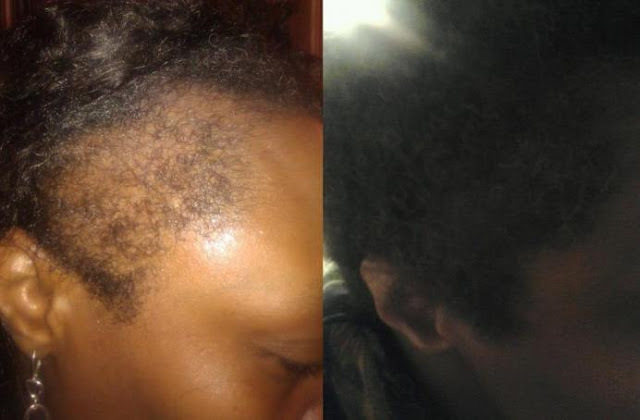 The woman was very nearly bald from her natural hairline to her ear due to damaging weaves and chemicals. Within 5 months, with daily application of JBCO, she completely regrew her edges!! Now, onto using JBCO on my ends. Different story entirely. O … M … GAWH!! When I tell you that I fell in love with it from the first use, I’m not kidding! I used it on these two strand twists that I’d done and my ends felt like BUTTER! They were sooo soft, supple, smooth, sheeny and moisturized (I know, I know! Oil doesn’t moisturize! Buuuuuut, it seals in moisture and a good sealant keeps moisture in the hair leading to hair that feels moisturized!). I not only use JBCO to seal my ends, I also use it in my leave-in, add it to some of my deep conditioners and I’ve experimented with it as a pre-poo oil for my ends. I’ve recently started mixing it with Extra virgin olive oil, in order to get the penetrating benefits of olive oil with the sealing benefits of JBCO. Using a 50/50 ratio mix, I’m also able to extend my JBCO further and mask the overt smell of olive oil so that I don’t smell like an Italian restaurant! Anyone use JBCO? If so, how do you use it? How often? What kind of results are you getting (i.e. increased thickness, regrowth of edges, decreased shedding, improved moisture retention, etc.)? What are the pros and the cons? Spill! I've never used JBCO when I saw the price & the cost of shipping I was like no ma'am. I have used regular castor oil to regrow my edges after my post partum shedding & it worked wonders, however I did try it on my scalp as you did Shelli & I got the same itching & I've never used amla paste. I think it might just be one of the side effects of the oil until you get used to it. I love JBCO. It leaves my hair feeling soft, silky and nourished. I use it on my children's hair too and get similar results. When I first tried it over three months ago I didn't like the smell or consistency but as mentioned in the post this quickly dissipates and it is not sticky or cloying. Even my OH who is a product virgin uses JBCO and it leaves his hair looking so shiny. I use it on my damp hair on it's own. Or mix with hair butters if my hair is really dry. JBCO is definitely my staple product, I plan to blog about my results with it soon too. I'm from country, in Jamaica, so I used this stuff (not this particular brand, but some bought at the market). I couldn't stand the smell but it softens my really dense, thick hair. It's so funny that I have come back to it after practically running for the hills when I finally got control over my own hair. I've also used the Home health brand. Both seem to soften but the JBCO seems to do a better job. I used it for 2 months straight on my edges and didn't see a difference, but because I didn't want to waste my money, I decided to use it to seal instead but it was too thick for my 4b hair so now i just add it to my henna or deep conditioners so I can get my money's worth.
. I would have to buy off the site. I am impressed that this helped someones mother grow her edges back in five months that is some good stuff then. I've been wanting to try this for a while. I plan to use it on my scalp for growth. Thanks for the review. Will this help with frizz? That's my issue. Any recommedations out there on this? I've tried all the natural remedies. I've also tried frizz defy by Nexxus with no luck. Help! I used JBCO on my edges for several months and saw absolutely no results. In fact, it actually caused a pretty bad breakout on my skin, around my hairline. I used the original JBCO almost a year ago when I was transitioning with box braids because I was paranoid about broken edges. However, I didn't use it consistently (1. I was lazy, 2. it was kind of hard to apply to my scalp 'cause of all the braids) enough to say that it made any sort of difference. After taking down my braids my hairline, just the first 2 cm or so, was a little see through and my edges were thinner. 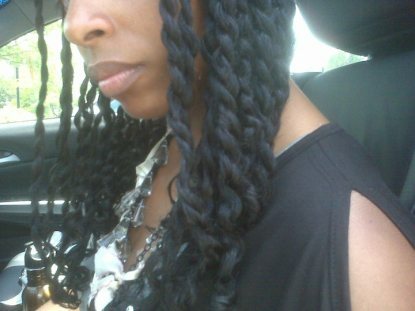 On my second set of braids , I used JBCO in my hot oil treatments as well as Amla and EVOO. I definitely noticed that my edges were in full effect after 8 weeks or so, but I dunno if that's 'cause my hair wasn't being manipulated and pulled so much or because of the Amla. I then got a second set of braids, took much better care of them this time and applied coconut oil (to the length) and JBCO (to the roots) religiously. I had a lot less breakage this time around. Since cutting off my relaxed ends, I use JBCO in my hot oil treatments and sometimes as a sealant. I would say that when I do use it consistently, I definitely notice decreased breakage and increased thickness. The only cons are that I can't find it in stores where I live (I buy it on Amazon), the thickness, and the smoky smell. I'd like to try the lavender one to see if the smell is any better. I now use an applicator bottle to apply 'cause it is pretty thick. It also lasts a pretty long time. I'm only on my second 4 oz bottle and it's almost been a year. Hope this helps! I love JBCO for my edges. when I had braids they really helped to thicken my edges. I stopped for a while but thnx for reminding me to jump back on the bandwagon. I never used JBCO. I have used the Home Health kind before. My results were ok. I saw on this one blog some lady used a derma roller and applied a mix of rosemary oil and garlic oil to her temples. She said it gave her some results by helping the oil penetrate better into her follicles. Like Shelli, my hair doesn't particularly respond well to shea butter or coconut oil. My loves jojoba, sweet almond, evoo, grapeseed and (cold pressed) castor oils. Never tried JBCO but now I'm sorta interested in it. Can't wait to hear more reviews. Thank you for posting this Shelley! I used regular castor oil (CO) from the health food store when I first BC'd in '09, but stopped due to the greasiness and stickiness. I had to stop using it yall, my scalp itched like a bad weave! I was tapping, scratchin' and pokin' all day long! I did internet searches about itching+castor oil, and I had to stop using it. Some posters said keep using it through the itch, and it will subside, but no bueno - I was afraid of the scalp irritation. Around that time I had purchased a bottle of JBCO to jump on the JBCO bandwagon, but was afraid to use it because of my past experience. But, you've piqued my curiosity - so I'll have to blow the dust off it and put JBCO into rotation! I am going to try this for my little one. I have heard about this before so I will have to get this. Thanks for the info. I use JBCO in my shea butter mix. I have used JBCO to grow my edges in the past. I started using NOW Castor oil and it also worked wonders for me. I also prefer the smell of NOW. Another plus to the NOW version is that I get it 16 oz with FREE shipping on Amazon from VitaminLife. Can't beat that. I'm not saying that's something I would try. I'm only sharing what I read someone else did. I LOVEEEE JBCO! When I first purchased it I would grease my scalp with it about 3-4 nights per wk. I definitely noticed growth overall! I then discovered that it works wonders for sealing in moisture. I feel like I sound (well type) like a JBCO representative but it really does the job, for me.Hahahaha. I battle dry hair so whenever I need to seal in moisture (and I feel like dealing with the itch), Ill use it. Ill grease my scalp and apply on the ends. I never thought the itch was irritation, but maybe I just psyched myself up and told myself its my hair growing LOL!! But yes....JBCO is my favorite. I love jbco as well. I too have issues with psoriasis on my scalp and jbco was the only thing that worked to keep my scalp from drying out and eventualy developing HUGE SCALY FAKES....the jbco is very thick and it coats the scalp welll.. I have heard about JBCO but its not available in my area. I can only get online. I did get some castor oil from whole foods. I like it, but it is sticky. I use very sparingly. I only use it to seal my ends and I rub some on the thin parts of my crown area. I haven't noticed a significant difference but I guess its helping. I also add a few drops in my oil mixture. I've been wanting to order JBCO for a while now, and I think its time for me to take the plunge. I have box braids in now and have been using castor oil on my scalp during the week. Because I've been so paranoid about my edges, I've been very tempted to order the JBCO. Guess I won't know, til I try it out, but I've heard nothing but good things! Which site are you guys ordering from? I use JBCO and it has helped with my psoriasis and my edges. I have my mom get mine straight from jamaica in the market and send it to me here in Florida. I use it almost every day with other oils I have in a spray bottle and water. I also use it with egg whites and a plastic bag...sit with it for 30 mins to an hour. I LOVE IT. Until i started reading various blogs, etc. and searching for castor oil in the BSS, I didn't realize there were other types of castor oil, I only thought it was JBCO. I only use JBCO because to me that is the truest form of castor oil. I use it in Kimmaytube leave-in and once in a while when I need to detangle I use it with water as a pre-poo. Great article Shelli! I have used regular castor oil in my Kimmaytube leave in and it leaves my hair really greasy. I'm a little nervous to buy JBCO because of this. I may try castor oil in the winter time when hair tends to be drier. I tried castor oil in the summer which may not have been the ideal time to try it.